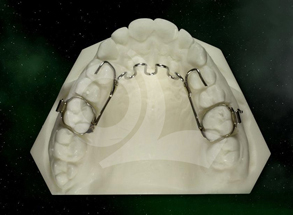 This fixed brace is often used for patients with a frontal open bite. The cage influences the position of the tongue, keeping it out of the open bite area. The occlusal supports on the 1st premolars provide stability of the appliance. For the precise manufacture of the Habit Breaker, a lower impression with bite registration is required to determine the correct occlusion.